Oops - we don't appear to have a video for the can Pro 5 File. Administrative professionals know better than anyone that a misfiled document is a lost document. IRIScan Pro 5 solves this problem and makes your job easy! This duplex desktop scanner (automatically) performs tedious tasks for you,such as organizing folders,sorting,searching,and filing. IRIScan Pro 5 File offers advanced features for semi-automatic file sorting into predefined folders. You can also make use of the "Smart Tasks Button"feature to program up to 9 automated tasks associated with the scanner's buttons (Scan to PDF,Scan to Dropbox,Scan to Salesforce,etc. ). IRIScan Pro 5 is a powerful tool for self-employed professionals and freelancers. With its advanced features and its high added value()software suite,it allows you to manage your invoices,contracts,and other files efficiently. Focus on your business and your customers,and avoid wasting time shuffling papers. 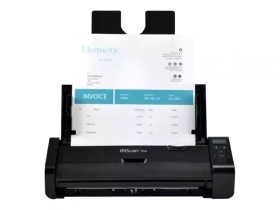 Compact and lightning fast,this desktop scanner can scan your documents from your home or office. You can then share them directly with others! Quickly scan lots of accounting documents (invoices,expense reports,balance sheets,etc. ) and manage them intelligently within your preferred platform (MS SharePoint,Therefore,Dropbox,etc. ). Documents can be converted into multiple formats simultaneously (including Excel and indexed PDF documents). All this is done with exceptional reliability and in accordance with the sector's legal standards. Choose IRIScan Pro 5 Invoice for semi-automatic invoice sorting and easy expense tracking. Boost your productivity,and cut your costs! With IRIScan Pro 5,make all of your ID cards 100% digital! Simply insert cards into the cart slot on the front of the scanner. In addition to laminated cards,you can easily scan your contracts and daily correspondence for digital filing. By integrating with MS SharePoint and Therefore,you can digitally share,track,and manage your contracts. This desktop scanner saves you long hours of filing,as a lawyer and/or solicitor. Focus on your hearings and investigations,and devote more time to your clients and the things that matter! With this multifunctional scanner,you can reliably scan medical records,medical prescriptions,Cartes Vitales,insurance cards,medication plans,and more... With the press of a button,your scans are converted into PDF or JPEG format (among others) and then shared instantly with your colleagues and associates on your preferred platform (Dropbox,OneDrive,etc.). This compact scanner fits perfectly behind a counter or in the corner of an office. It is suitable for all (para-)medical environments,such as hospitals,pharmacies,and medical practices. It is a must-have tool for everyday efficiency. Stop wasting time and energy hauling around paper wherever you go! During property visits and appointments,paper only clutters your bag,vehicle,or office and slows you down. With IRIScan Pro 5,you can scan application files and documents related to the properties you are managing,in minutes. And you can save them in any format (PDF,JPEG,Word,etc. ). Store your files on your preferred cloud platform(Dropbox,SharePoint,Google Drive,etc. ),and sort them easily.